Hey media, wanna' know why we don't trust you to be objective? Things like this. This is just a needless knock. So condescending. 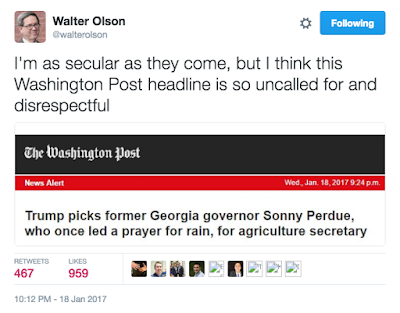 The beauty of this headline/social media hit on Perdue is that it manages to raise questions about the paper’s ability to fairly cover both conservative politicians and religious people, in one fell swoop.